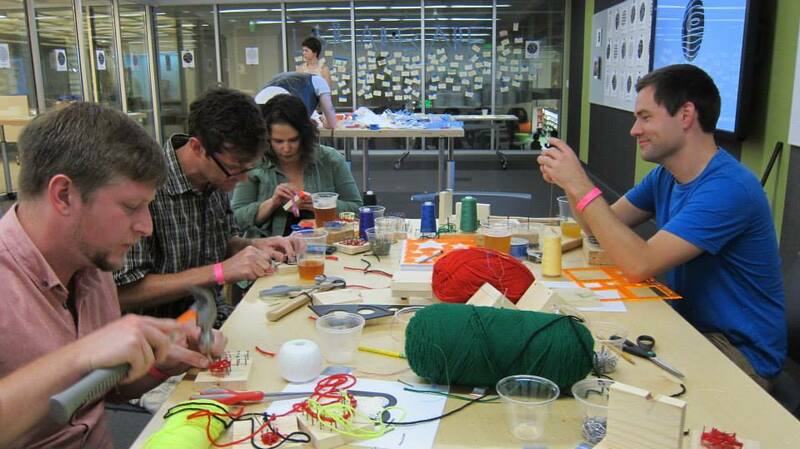 Creative spaces are concepts that are rich in possibilities and opportunities for today’s libraries. In the simplest of terms, a creative or creativity space is any place where people can create, tinker, play, explore and discover through a variety of materials, tools and interactive discussions. These spaces of inspiration and imagination come in many shapes, sizes and price points. They can be anything from a table or a booktruck filled with arts and crafts supplies to a learning garden outside the library to a full digital media center. Whether a public, academic or K–12 library, a creativity space provides an opportunity for offering services that engage users of all ages and backgrounds, addresses their needs and interests, and supports lifelong learning. 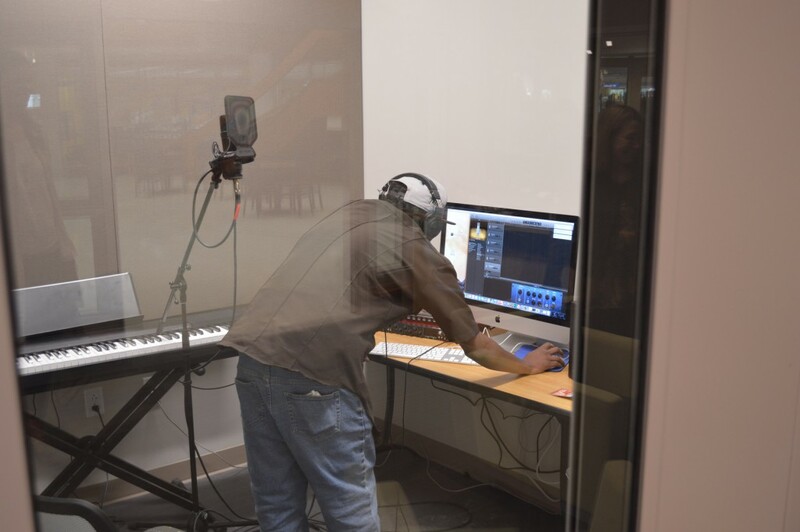 The addition of creativity spaces in library environments is not driven by an arbitrary trend to keep libraries relevant but out of necessity to meet the changing landscape of education. Research has shown that self-directed, experimental, content-rich learning promotes executive function skills, a term that describes the management of cognitive processes, including working memory, reasoning, task-flexibility and problem-solving as well as planning and execution. Strong executive function skills are instrumental in shaping one’s success in school and in life. A focus on hands-on learning is being widely adopted in schools today to support the recent changes being made in assessments and curriculum. These curriculum changes are driven by the national commitment to early learning and the adoption of Common Core State Standards and assessments. Furthermore, the climate of economic uncertainty in America that began in 2008 is now turning to innovation as the way to ensure a prosperous future placing a great emphasis on Science, Technology, Engineering, Art (Design) and Math — the STEAM subjects. All of these subjects require an environment which can provide hands-on experiences. Offering environments that promote creativity and innovation is a natural evolution for libraries today as they continue their universal mission to support education and promote life-long learning. 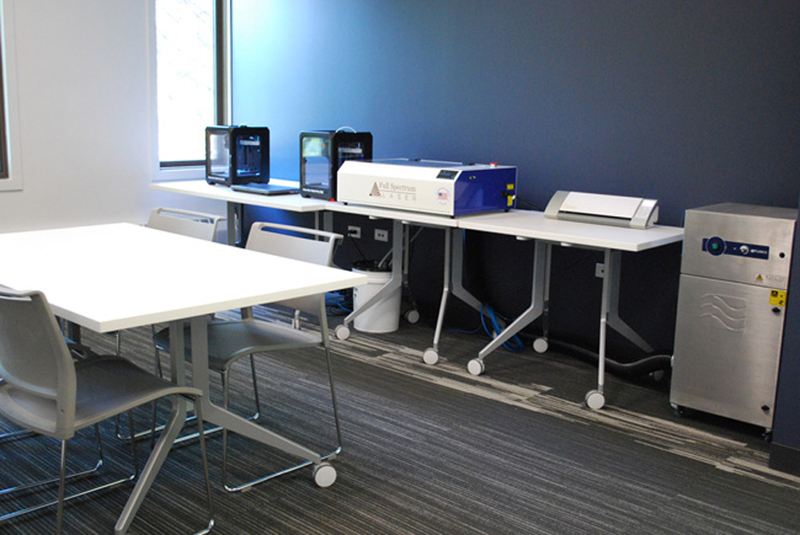 Early adopters of libraries as locations to support content creation immediately added makerspaces with high tech equipment such as 3-D printers and laser cutters. However, as this trend continues to gain momentum, libraries are beginning to look at the concept of creation spaces in much broader terms. The result is more targeted services that best meet the interests and needs of the specific community. 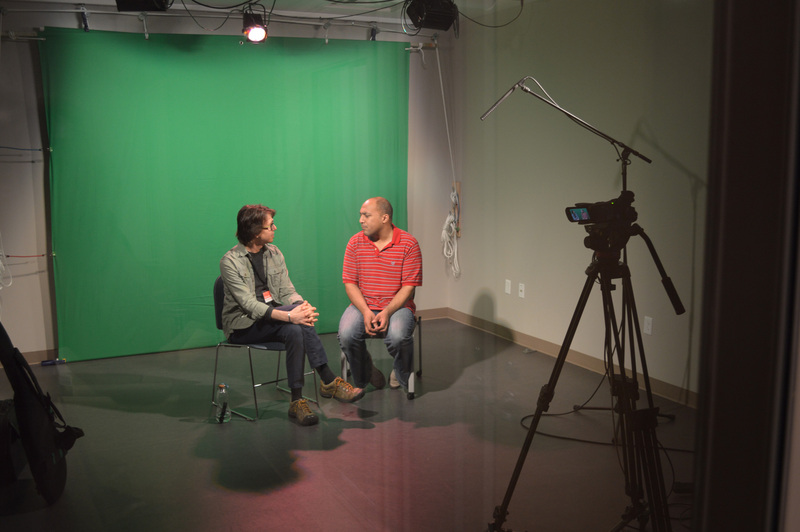 Offering a variety of opportunities for physical and digital creation geared toward both independent and collaborative work leads to a rich learning environment attracting a diverse group of users. As a result, it is important that library programs are designed to adapt to these opportunities. Creativity spaces should be designed to allow for easy collaboration. Most of the activities listed in the graphic below provide opportunities for users to work together. 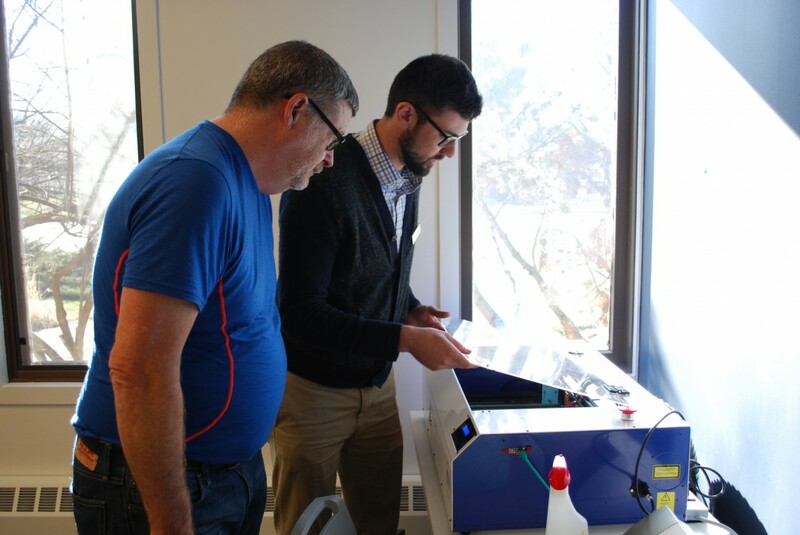 Examples of group collaboration opportunities in a creation space include a couples cooking class or a large robotics project in which individuals work on smaller elements and then come together to create the finished product. It is also important that creativity spaces easily adapt for independent study and exploration. Many of the activities detailed in the graphic below can also be independent pursuits. One might assume that a co-working space is needed for collaboration, but a quiet workspace may be all that is needed for completing an individual task. Programming Specific: Libraries provide organized, structured programs for users to learn special skills. Project Specific: Spaces and tools are provided so users can complete specific projects in either organized classes or at their own pace. Free Form: Spaces and tools let users experiment on their own. Since physical and digital activities can be both collaborative and independent in nature, designing flexibility into the spaces to support these two types of activities is important. Designers: Matheu Architects, P.C. (Bloomington, IN) and Kimberly Bolan and Associates. These spaces are for use by all ages. 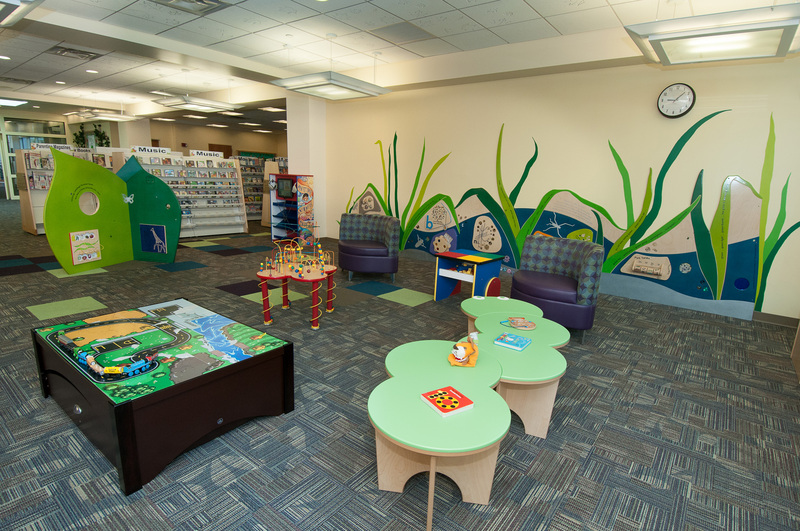 In planning any library space, it is important to take the time to understand the programming requirements. To best understand how the space can serve the library’s mission of offering a creativity space, below are a series of questions to help you engage in proper discussions to help ensure the remodeled or new space will properly support the services that the library will offer. Why does your library desire to have this type of space/service? What drives this interest? Learning oriented goals, objectives, vision? Desire to better serve library users (children, teens, adults, etc.)? Desire to attract non-library users? 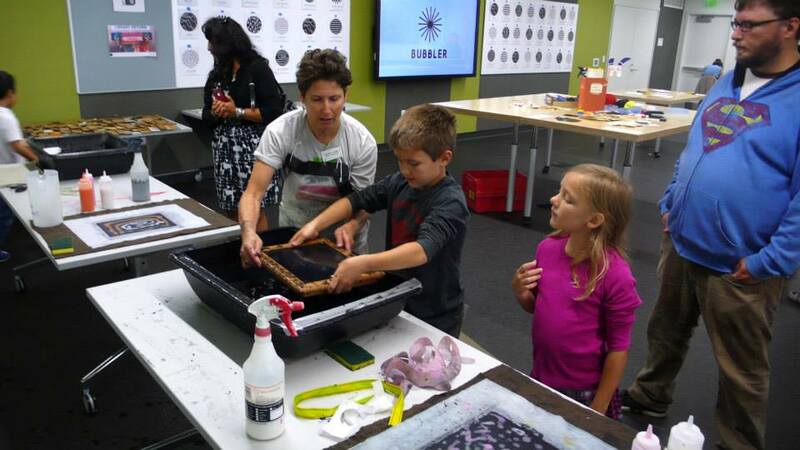 Want to establish an interactive and innovative environment for all ages ? Will your creativity space offer passive programming, formal learning opportunities/programming or a combination of these? How often do you hope to offer creativity opportunities (e.g., daily, weekly, monthly, quarterly, etc.)? What ages with you serve? Children, teens, adults, multi-generational or combination? Will there be hours of operation, all day access, limited number of people based on room size, reservations to use the space or service? This may vary from service/space to service/space. Who will manage the space? 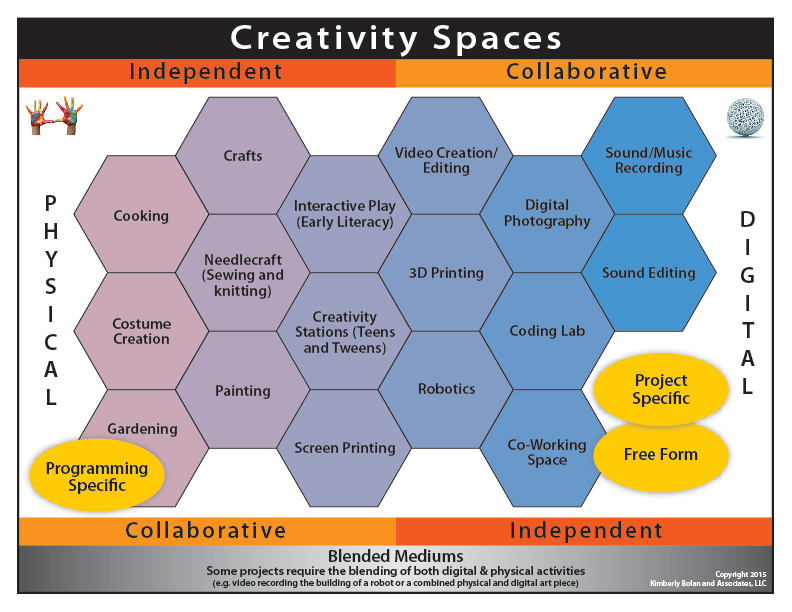 Who (i.e., what positions) and how many staff will be involved in working with and in the creativity space(s)? Will you incorporate volunteers into staffing, training and/or programs? If so, which ones and how will you manage this? NOTE: Creativity space in libraries opens up new opportunities and ways to staff the library and its various service areas (creativity space being one of them). Explore the interests and talents of all staff members. Will materials be purchased by the library or school, donated by the users or a combination of both? What is the ongoing budget support for these services? Is this a sustainable effort? Is it an innovative project to test out? Encourage the library staff to seek input from users to establish a direction in terms of activities and types of spaces based on community interests and suggestions. Share images of the possibilities and let users provide feedback. Set up a series of focus groups with various parties: parents and caregivers, teens, adult users and non-users, community leaders and business owners. It is important to understand the types of programs that interest the community to be sure the proper infrastructure is developed to support these activities. 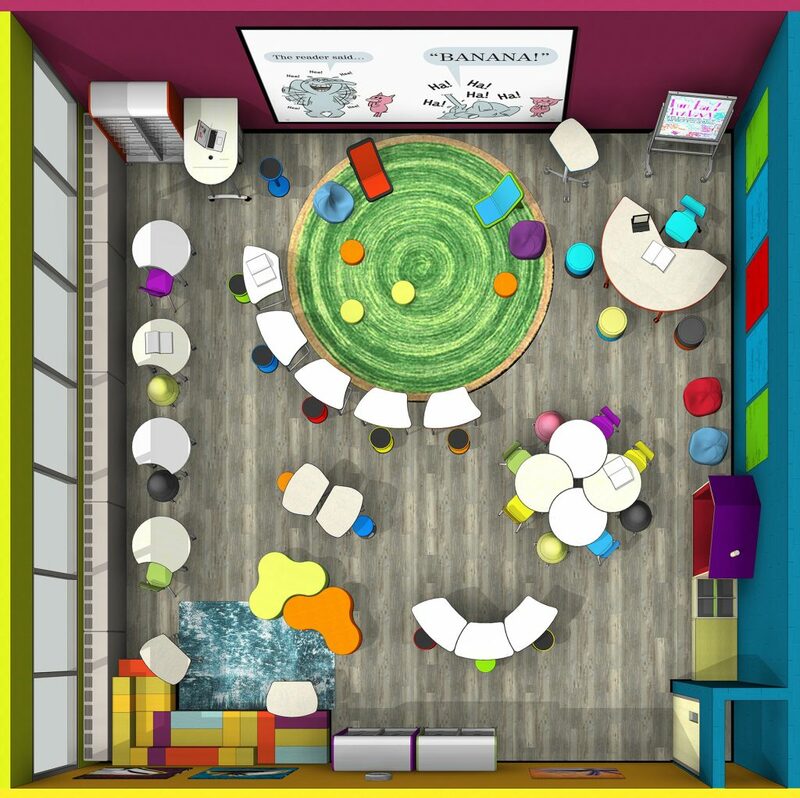 Keep in mind creativity spaces are active learning environments that will have different requirements than traditional library programming. Pay special attention to lighting, acoustics and access to power. 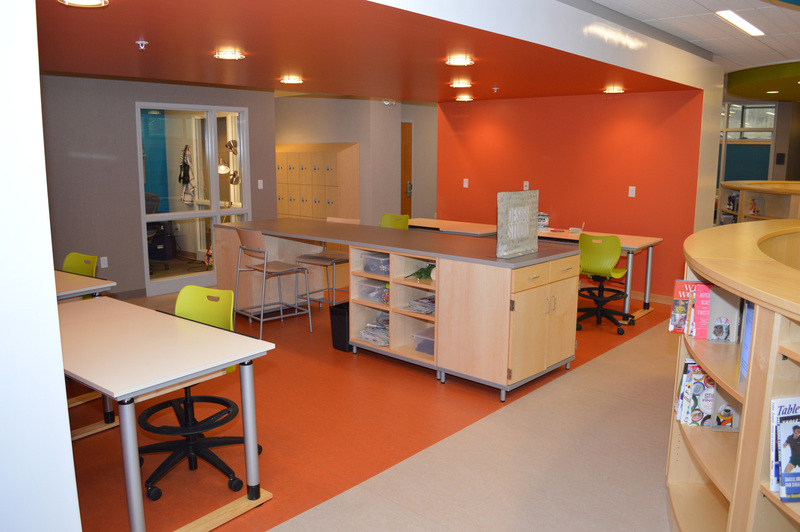 Incorporate changes in flooring to best serve the types of activities such as hard surface materials where arts and craft activities or science experiments will take place. Select furniture and finishes that are easy to clean, allowing people to create without worry of damaging things. Furniture should be durable and moveable so that it can be easily rearranged as needed. Incorporate the feature of height adjustability when appropriate. Ergonomic chairs are necessary for those tasks that require a considerable amount of sitting time. Plan for storage needs up front and consider a variety of storage options. 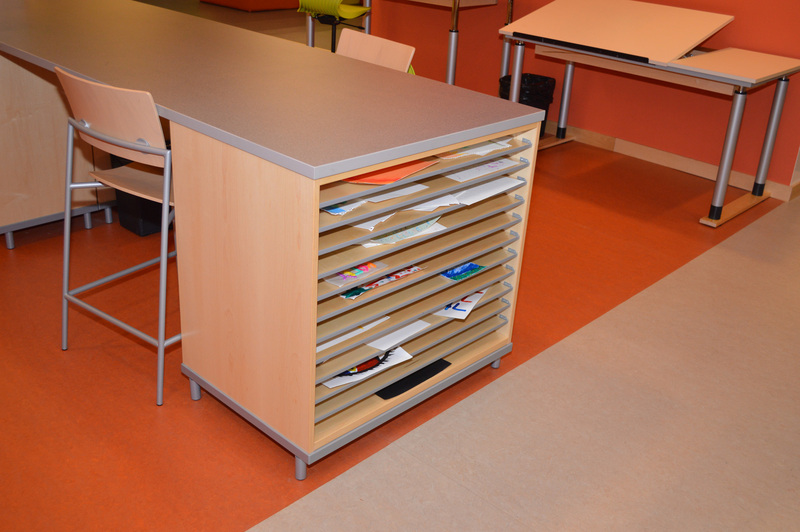 For example, lockable storage is needed for items that should only be accessed by staff, and open storage works for items that should be easily accessible to users. Strongly consider using casters on tables, chairs and storage units to make it easier to clear out a space for other programs. 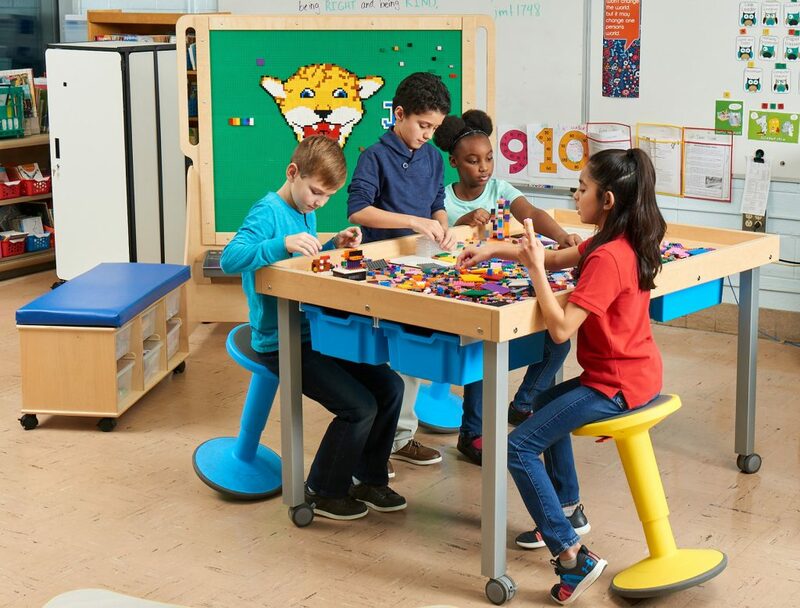 For larger spaces where programming will be conducted, incorporate some type of mobile instructor/leader podium workstation. Areas should be clearly signed in terms of wayfinding and instructions. Choose signage solutions that are flexible so they can be easily changed as appropriate for the activities and instructions. Brainstorming with library staff and the communities they serve about the possibilities should be an integral part of any library building and renovation project. 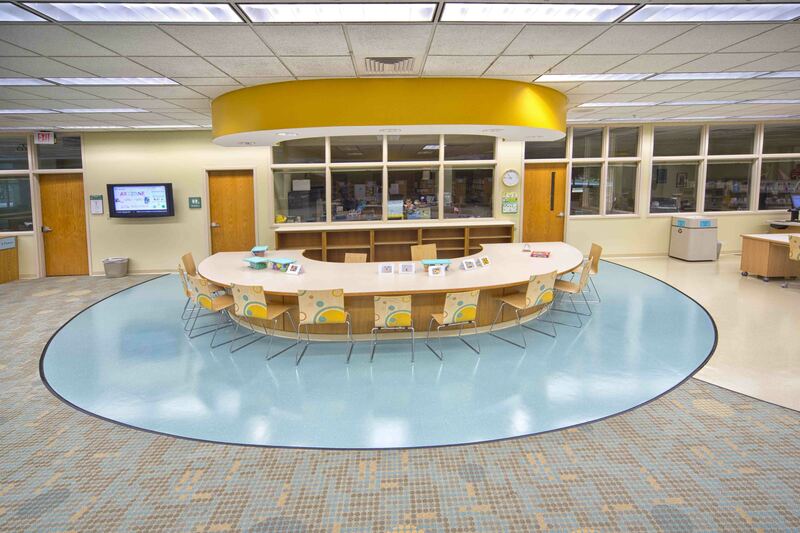 The opportunities for incorporating creativity spaces in libraries are endless and necessary to best support today’s educational landscape.